Definition at line 19 of file Sequence.h. Definition at line 33 of file Sequence.cc. Definition at line 27 of file Sequence.cc. References debugs, elements, and FinishAllElements(). Definition at line 322 of file Sequence.cc. References DBG_CRITICAL, debugs, elements, RefCount< C >::getRaw(), and ESISegment::ListTransfer(). Referenced by ESIAssign::addElement(), makeCachableElements(), and makeUsableElements(). Definition at line 177 of file Sequence.cc. References debugs, elements, esiTreeParent::fail(), failed, FinishAllElements(), NULL, parent, and processing. References debugs, elements, FinishAllElements(), NULL, and parent. Definition at line 60 of file Sequence.cc. 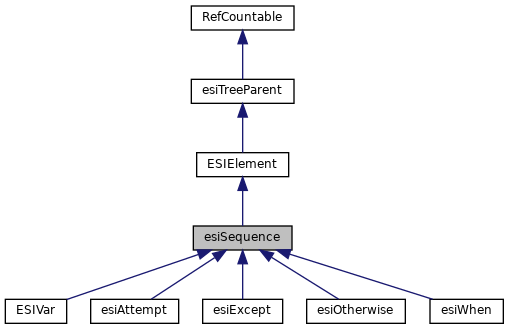 References addElement(), assert, elements, and RefCount< C >::getRaw(). References assert, debugs, elements, esiSequence(), failed, RefCount< C >::getRaw(), makeCachableElements(), NULL, and processedcount. References assert, debugs, elements, esiSequence(), failed, makeUsableElements(), NULL, parent, and processedcount. Referenced by makeUsable(), and esiWhen::makeUsable(). Definition at line 48 of file Sequence.cc. Referenced by finishedProcessing(), process(), and processStep(). Definition at line 54 of file Sequence.cc. References assert, debugs, dovars, elements, ESI_PROCESS_COMPLETE, ESI_PROCESS_FAILED, ESI_PROCESS_PENDING_WONTFAIL, ESISegmentFreeList(), failed, FinishAllElements(), finishedProcessing(), flags, RefCount< C >::getRaw(), ESISegment::len, ESISegment::next, nextElementToProcess(), NULL, parent, processedcount, processing, processingResult, processStep(), esiTreeParent::provideData(), provideIncrementalData, render(), and wontFail(). Referenced by processOne(), and provideData(). Definition at line 200 of file Sequence.cc. References debugs, elements, ESI_PROCESS_COMPLETE, ESI_PROCESS_FAILED, ESI_PROCESS_PENDING_MAYFAIL, ESI_PROCESS_PENDING_WONTFAIL, fatal(), process(), and processedcount. Definition at line 187 of file Sequence.cc. References debugs, nextElementToProcess(), processingResult, and processOne(). References assert, debugs, elementIndex(), elements, ESI_PROCESS_FAILED, FinishAnElement(), flags, RefCount< C >::getRaw(), process(), and processing. References assert, debugs, elements, FinishAnElement(), i, ESISegment::next, NULL, processedcount, and ESISegment::tail(). References assert, failed, and mayFail_. Referenced by esiSequence(), and process(). Referenced by addElement(), elementIndex(), fail(), finish(), finishedProcessing(), makeCachableElements(), makeCacheable(), makeUsable(), makeUsableElements(), process(), processOne(), provideData(), render(), and ~esiSequence(). Definition at line 54 of file Sequence.h. Referenced by fail(), makeCacheable(), makeUsable(), mayFail(), process(), and wontFail(). Referenced by esiSequence(), ESIVar::ESIVar(), process(), and provideData(). Definition at line 53 of file Sequence.h. Referenced by mayFail(), and wontFail(). Definition at line 59 of file Sequence.h. Referenced by fail(), finish(), makeUsable(), esiWhen::makeUsable(), and process(). Referenced by makeCacheable(), makeUsable(), process(), processOne(), and render(). Definition at line 57 of file Sequence.h. Referenced by fail(), process(), and provideData(). Definition at line 58 of file Sequence.h. Definition at line 56 of file Sequence.h.